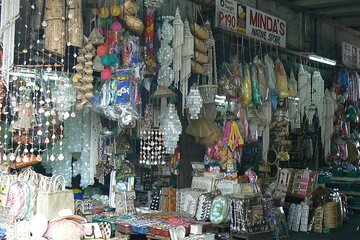 From bargain stores to upscale boutiques, you'll find plenty on offer during this 3-hour shopping tour in Manila. A personal driver-guide accompanies you in search of antique treasures or handcrafted souvenirs, including round-trip private transport from your hotel. You'll explore three of Manila's top shopping destinations. Upon hotel pickup, start your shopping tour in the bustling city of Manila. Settle into the comfort of a private vehicle and learn from your personal driver-guide about each destination before proceeding onward. As this is a private tour, the 3-hour itinerary can be customized to your interests while you explore flea markets, bargain stores, and mainstream shopping malls at your own pace. Head to the Greenhills Shopping Center and Tiendesitas, two mall complexes where you can find jewelry, handicrafts, fashion clothes, furniture, antiques, and novelty items. Then continue on to Makati and visit the retail stores of Greenbelt Mall along with the hip stores and upscale boutiques in adjacent Glorietta Mall. Finish your tour at the SM Mall of Asia (SM MOA) in Bay City. At the fourth largest shopping mall in the Philippines, you can find almost anything your heart desires. Once the tour is complete, you’ll be taken back to your hotel.